The products I bought in March. 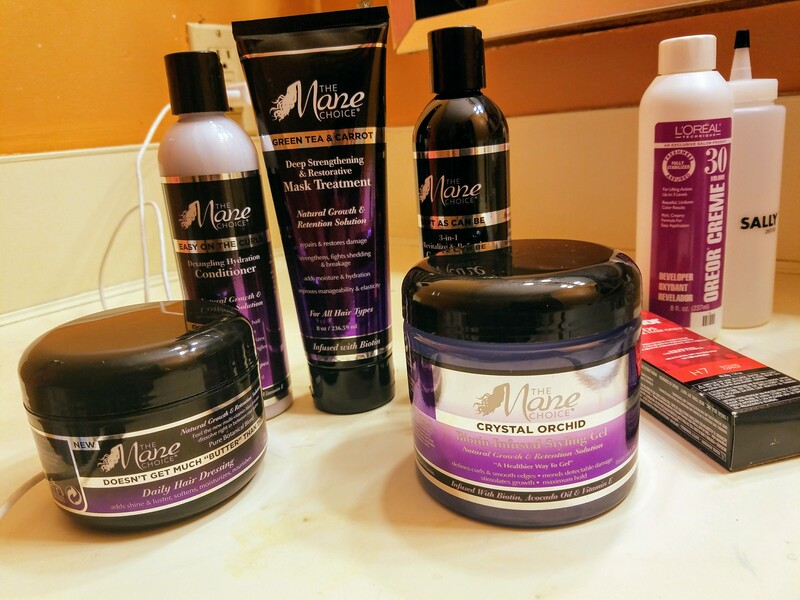 If you’ve been around the natural hair community for even a small amount of time, you recognize the magnificent royal purple branding on The Mane Choice product line. It doesn’t matter if you only see the vitamins, shampoo and conditioner (like at most of the beauty supply stores around me) or your just browsing social media sites for curly hair styles. You will see The Mane Choice and think, “That looks like some good stuff”. I live in the Midwest (Grand Rapids, Michigan to be precise), where beauty supplies for curly girls who don’t wanna consume a bunch of poisonous, carcinogenic products are limited. I’m also a product junkie who enjoys using products of the same line. The beauty supply stores in my community only offered the vitamins for a long time. Only recently I started seeing the shampoo and conditioner but no styler. Stylers are everything to my curls so I haven’t bought any of The Mane Choice products until I walked up in Sally’s Beauty Supply in Gaines Township and found most of the original products. (The new Lemonade and Egyptian lines came out right after. I’ll try those and review when my #productjunkie budget bounces back.) I gotta give Sally’s a shout out for bringing more natural hair products for my texture, especially on my side of town. My local Target has a limited selection. This product surprised me. I don’t use shampoo but have always co-washed with my conditioners. Still, I never thought I’d find a product packaged as a co-wash and a leave-in, yet here it is. I was skeptical but it worked out fine. It was nice and creamy. It had a moderate level of slip that allowed me to de-tangle my naps well enough as a co-wash. It did a decent job cleansing but I liked it better as a leave-in and refresher. I also want to note that it worked best for me when I used the capping method (throw on a shower cap so the heat from my head can help my tresses absorb the product better since I have low porosity hair). It helped my hair stay soft. I used it alone as a leave-in and to refresh second and third day curls. It worked pretty good and mixed well with the other The Mane Choice products I bought. I like this product well enough. Just like the co-wash, it smelled delightful. It has a pretty thick consistency and I love that. It my hair feel soft and silky. What I don’t like is the slip. I was still able to de-tangle just fine but the slip makes me feel like my hair is moisturized. I also don’t like the price. It’s $13 and I get the same results with a $5 bottle of TREsemmé Naturals Botanique Nourish and Replenish Conditioner and get three times as much. I’m not sure my hair likes butters. This is a shea butter and coconut oil-based product with a lot of other healthy ingredients. I didn’t use it too much. You have to rub the product in your hand to melt the butter. If you rush and don’t activate it, you’re hair will be white. Don’t nobody got time for that! I’ve only been rocking wash and goes but I think it may work well on some fingercoils. twistouts and braidouts will be another option. My hair is too short for all that right now. I put in in the back of the cabinet until I’m ready for that. It costs $16 so I have to figure out how to make it work for me some how. I love it. I really love it. The slip is fabulous. I just raked my fingers through my hair to de-tangle. I like it like that. I used it to deep condition, of course. I didn’t need to add anything else (e.g., grape seed oil, olive oil, etc.). I applied it after co-washing. I covered my head with a shower cap for 30 to 40 minutes. I didn’t apply heat. When I rinsed my hair, it stayed moisturized. I used the 3 in 1 as a leave in. My hair absorbed the product well. I can’t say enough about the smell. The price is the only downer. It’s on the expensive end of the price spectrum. It costs $18, which is almost $7 more than most deep conditioners I’ve bought in the past. I’m going to buy it again though. I’ve been mixing two different masques with oils and other ingredients. This is packed full of nutrients that reinvigorated my hair. It’s cheaper in the long run. It also saves time and space in my cabinet with fewer containers. I really like this gel too. My hair requires a good styler. I don’t like products that make my hair dry, flaky, or crunchy. Some of the cheaper stylers will do that. It’s not like you can’t use some oil to break the cast; but again, why do so much work when you can use a styler that doesn’t harden? I’m on my second bottle of this for that very reason. I noticed that it didn’t mix well with all of the moisturizing products. I’m specifically thinking of the Daily Hair Dressing. Maybe I used too much of one or the other but anytime I combined them, a gloopy, glue like substance was in my hair. I tried to get it to absorb by using a shower cap to no avail. I tried to soak up the excess product with a paper towel; but nope. I had to wash it out and use the gel alone. I’ve used the gel with the 3 In 1 and some other products I recently bought. It worked fine with those. I have used it on wet, damp, and dry hair. Sometimes appears that it will sit on my hair but it actually absorbs rather quickly. I have shingled my hair in small sections and just rubbed a bunch all over my head. As long as the tresses are covered from root to end, it magnificently on my wash and goes. Sometimes I spritz it with water and oil. Other times I just seal the moisture with oil. No matter what I’ve done to it, the outcome has been nice, defined hair. The price is pretty reasonable at $12. Some will say it’s expensive but I’ve honestly spent more on stylers. Try it out and tell me how you like it. I’ve heard some people say it dried their hair out. I just bought two more products from this line last week, the TROPICAL MORINGA OIL & HONEY DAILY MOISTURIZER & SEALING CREAM & DAILY RESTORATIVE SPRAY. I’ll reveiw them after I’ve had more time to test them out. I do have some pictures to share though. The Mane Choice was founded by a black women on her own natural hair journey. Founder, Courtney Adeleye, is also a registered RN who partnered with a physician to develop products that are safe and effective for women of color. The classy branding, packaging and fragrance makes you immediately feel good about your purchase. It works well on my coily hair that has low porosity. The products are expensive. I spent $90 on five products with my Sally’s discount. The styler and masque aren’t readily available. Sally’s has the most I’ve seen. My closest Walmart and beauty supply stores don’t carry any of it. Walgreen’s, Target and a Meijer have a limited selection (shampoo, conditioner, 3-in-1). Hopefully that will change soon. Make sure you subscribe, comment, and like if you found this article helpful and would like to read more like this. I’d love for you to suggest some products for me to try too. Thank you for writing this blog. I enjoyed reading your reviews on products you have tried – So I do not have to do as much “guessing” on what product I might want to try! Keep blogging!